All countries with influence over the grinding conflict in Syria should use all the “moral pressure” they can to avoid a full-scale military attack on Idlib, particularly Russia and Turkey, the United Nations top negotiator Staffan de Mistura said on Tuesday. Appealing directly to President Recep Tayyip Erdogan of Turkey, and President Vladimir Putin, the UN Special Envoy for Syria explained to journalists in Geneva, that the two leaders had spoken to each other about the protection of civilians in 2016 after the fall of Aleppo to Syrian Government forces, and appealed for them to do so again now. “You were the ones who actually were able to talk to each other, to make a telephone call, organize a formula that allowed the end of that horrible period not to be the worst,” he said. “A telephone call would make a big difference even before Tehran,” he told reporters, in reference to the leaders’ upcoming meeting in the Iranian capital on Friday. Welcoming US President Donald Trump’s earlier statement cautioning against a Government of Syria attack on Idlib, lest it lead to a “potential humanitarian tragedy”, Mr. de Mistura said that he was sure that the Turkish and Russian leaders could find a “soft solution” to the problem if talks went beyond technical discussions. “We all continue to wish, to ask, to hope to avoid the battle for Idlib,” the UN Special Envoy said, noting that the north-west province had been hit by six airstrikes earlier on Tuesday. The need to secure the protection of some 2.9 million civilians in Idlib is urgent, the UN official explained, amid reports that a 10 September deadline had been set for an attack. Key objectives include preparing protection for routes to be used for the voluntary evacuation of those living and sheltering in Idlib, which is the last rebel stronghold in the country. These could be in the “east, south and north”, Mr de Mistura said, adding that the “whole principle can be that they, the people, can decide where to go”, before calling for UN humanitarian access. Speaking after a scheduled meeting of a humanitarian taskforce at the UN, Mr. de Mistura noted that 10,000 Al Nusra fighters remain in Idlib. They have been classified as terrorists by the UN Security Council, he explained, before adding that the priority was protecting civilians – the “men, women, teachers, health workers…children, squeezed in the anguish of not knowing what will happen”. 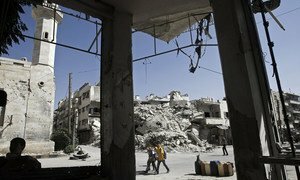 Also in Geneva, Senior Adviser to the Special Envoy, Jan Egeland, appealed to Russia, Turkey and Iran to give “hope” to the people of Idlib, in their capacity as guarantors of a deal to prevent fighting from escalating there. The US, Western countries and the Gulf countries should also do all they can “so that men with guns and power for once put civilians first”, he said, noting that there were “many more babies than there are terrorists in Idlib - there are a million children”. “If it succeeds we will have hundreds of thousands of lives spared, if it fails in the next days and hours we could see a battle more cruel than any previous battle in the cruelest war of our generation,” added Mr. Egeland. Earlier in the day Mr. de Mistura said that upcoming Syria constitutional consultations in Geneva on 10 and 11 September “could potentially, revive or give a chance of reviving, a credible political process” to end years of fighting across the war-ravaged country. The goal of the consultations – with Turkey, Russia and Iran – remained consistent with UN Security Council resolution 2254: the establishment of an “inclusive, Syrian-led, Syrian-owned” future, he said. Mr de Mistura also confirmed that he had received the names of individuals who could represent the Government of Syria and the opposition over a new, negotiated constitutional framework. “The constitutional committee can be and should be now the entry point for what we call a credible political process as long as the constitutional committee is credible as well,” the Special Envoy said. A UN Security Council meeting planned for 20th September, will review his report on progress towards the committee’s formation. 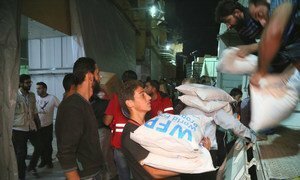 A further escalation of violence in Syria’s Idlib governorate could create a humanitarian emergency “at a scale not yet seen through this crisis,” a senior United Nations aid official warned the Security Council on Tuesday.